A few quick thoughts on the 2014 Kerloo Cellars Grenache from Upland Vineyard on Snipes Mountain. Kerloo Cellars was founded in 2007 by Ryan Crane, a protege of Forgeron Cellars’ Marie-Eve Gilla and Justin Wylie of Va Piano. The winery’s name is a play on “Curlew”–a genus of long, slender birds with down-curved bills that are distantly related to cranes. Located on Snipes Mountain, Upland Vineyard is owned by the Newhouse family who have been farming wine grapes since 1968. The vineyard includes blocks that were originally planted by W.B. Bridgman in 1917 with Paul Gregutt speculating, in Washington Wine, that the 1917 Muscat of Alexandria at Upland may be the oldest vinifera vines in Washington. Kerloo is one of over 20 wineries that sources fruit from Upland–joining a list that includes Betz, DeLille, Pomum and K Vintners. The 2014 vintage was Kerloo’s 4th release of Grenache from Upland Vineyard. 100% varietal, the wine was aged in neutral French oak barrels for around 9 months before being bottled unfined and unfiltered. Around 240 cases were produced. Medium-plus intensity nose–an interesting mix of black fruit and toasty cinnamon spice. This wine smells like Cinnamon Toast Crunch cereal. This wine smells and tastes like a less sweeten bowl of Cinnamon Toast Crunch cereal. On the palate, the black fruits carry through and become more defined as blackberries and black cherries. 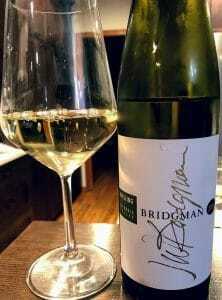 Medium acidity gives the wine some lift and freshness but not quite enough to be mouthwatering. The Cinnamon Toast Crunch cereal action also carries through but it adds character rather than sweetness. Medium tannins are very silky and balances well the medium-plus body of the fruit. Moderate length finish brings some pepper spice to the party. At around $40, this is a well made and pleasurable wine. But you are certainly paying a bit of a premium for it being a single vineyard wine and a relatively unique varietal. It’s a good change of pace but would be a far more exciting wine in the $25-30 price range. Tagged Betz Family Winery, DeLille Cellars, Forgeron Cellars, Grenache, Justin Wylie, K Vintners, Kerloo Cellars, Marie-Eve Gilla, Muscat of Alexandria, Newhouse family, Paul Gregutt, Pomum Cellars, Ryan Crane, Snipes Mountain, Upland Vineyard, Va Piano, Washington Wines and Wineries. 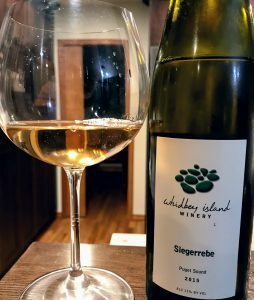 Going to need more than 60 Seconds to geek out about the 2015 Whidbey Island Winery Siegerrebe from the Puget Sound AVA. Full Disclosure: This wine was received as a sample. I gave some of the backstory of Whidbey Island Winery in my 60 Second Review of their Pinot noir from Cultus Bay Vineyard. A pioneer on the Puget Sound island, today Whidbey Island Winery is known as the “grande dame” of Whidbey Island vineyards. In addition to sourcing fruit from Whidbey Island, the winery also works with several vineyards in Eastern Washington including Crawford Vineyards in the Yakima Valley, Upland Vineyard on Snipes Mountain, Coyote Canyon Vineyard in the Horse Heaven Hills and Elephant Mountain Vineyard in the Rattlesnake Hills AVA. The Whidbey Island Siegerrebe comes from the Osenbach’s estate vineyard. First planted in 1986, the Osenbachs experimented with the grape along with Madeleine Angevine and Madeleine Sylvaner. The first vintage release of Siegerrebe was in 1991. 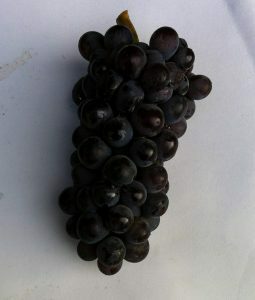 Heinz Scheu, son of the famous German grape breeder Georg Scheu, claimed that his father discovered Siegerrebe in 1929 from a spontaneous self-pollination of Madeleine Angevine. However, Jancis Robinson notes in Wine Grapes that DNA analysis has definitively shown that the grape is a crossing of Madeleine Angevine and Savagnin rose. Siegerrebe (whose name roughly translates to “champion vine”) is one of several new grape varieties–along with with Scheurebe, Huxelrebe and Chancellor–that Scheu bred in his nearly 40 year career at the State Institute of Vine Breeding in Alzey, Rheinhessen. In 1948, German breeder Hans Breider used Siegerrebe to cross with Müller-Thurgau to create Ortega–named after the Spanish philosopher José Ortega y Gasset. Another German breeder, Johannes Zimmermann, crossed Siegerrebe with Villard blanc to create the table grape Rosetta in 1960. Today there is only around 255 acres of Siegerrebe in its homeland of Germany–mostly in the Rheinhessen and Palatinate (Pfalz). Other countries with Siegerrebe include Denmark, Switzerland and in the Gloucestershire region of England. Siegerrebe was brought to the US in the 1980s when Gerard Bentryn of Bainbridge Island Winery became the first American winegrower to plant the variety. 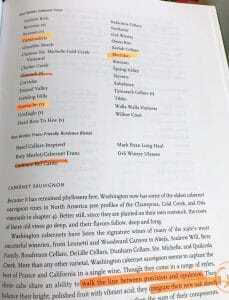 It was from these Bainbridge Island cuttings that the Osenbachs of Whidbey Island Winery planted their estate Siegerrebe. Another Whidbey winery, Comforts of Whidbey, also produce Siegerrebe from cuttings they procured from Whidbey Island Winery. Other islands in the Puget Sound AVA are home to Siegerrebe plantings–most notably Lopez Island Vineyards and San Juan Vineyards. Medium-plus intensity nose. A mix of orange blossoms and pear drop candy. Just a little too much pear drop candy note in this wine for my taste. On the palate that pear drop candy note comes through and brings noticeable sweetness. The orange blossoms also carry over but, surprisingly, the flavors get even more floral in the mouth with rose petals and undefined white flowers joining in. This wine feels like you are drinking a glassful of petals. Medium acidity gives some lift but I find myself wishing that it had just a bit more to help balance the sweetness. Moderate length finish ends with the pear candied note. While I absolutely adored Whidbey Island’s Pinot noir, this Siegerrebe is a bit too sweet for my personal style. However, it is very character-driven with lovely floral elements that I can see fans of Moscato enjoying as an opportunity to trade out some of their same ole, same ole. But at around $17-20, I do think wine drinkers are paying a little bit for the novelty of the grape. There are certainly more compelling values for off-dry whites such as Riesling and Gewürztraminer. Tagged Bainbridge Island Winery, Chancellor, Comforts of Whidbey, Coyote Canyon Vineyard, Crawford Vineyards, Cultus Bay Vineyard, Danish wine, Elephant Mountain Vineyard, English wine, Georg Scheu, Gerard Bentryn, German wine, Gewürztraminer, Grape breeding, Heinz Scheu, Horse Heaven Hills, Huxelrebe, Iowa wine, Jancis Robinson, Johannes Zimmermann, José Ortega y Gasset, Lopez Island Vineyards, Madeleine Angevine, Madeleine Sylvaner, Moscato, Müller-Thurgau, Oretga, Palatinate, Pinot noir, Puget Sound, Rattlesnake Hills, Rheinhessen, Riesling, Rosetta, San Juan Vineyards, Savagnin rose, Scheurebe, Siegerrebe, Snipes Mountain, Swiss wine, Upland Vineyard, Villard blanc, Whidbey Island Winery, Wine Grapes, Yakima Valley. Update: If you want even more Malbec Geekery, check out my post for this year’s Malbec World Day. Going to need more than 60 Seconds to geek out about this 2009 Bunnell Family Cellars Malbec from the Northridge Vineyard on the Wahluke Slope. Ron and Susan Bunnell started Bunnell Family Cellars in 2004. A botanist by training, Ron’s interest in wine led him to UC-Davis to study for a masters in viticulture. From Davis, Bunnell went to work at some of California’s oldest wineries such as Charles Krug and then Beringer. Here he was mentored by Patrick Leon (of Mouton Rothschild and Opus One fame) and Jean-Louis Mandrau (of Ch. Latour fame) who were consultants for Beringer along with emeritus winemaker Ed Sbragia. He was working at Kendall-Jackson with Randy Ullom when he got the opportunity to move to Washington State to take over the red winemaking program for Chateau Ste. Michelle in 1999. 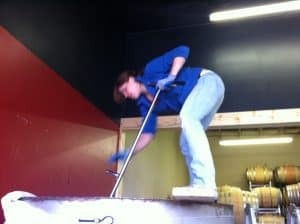 In this position, he followed in the footsteps of Mike Januik and Charlie Hoppes who left to work on their own projects. Here Bunnell worked closely with Renzo Cotarella of Antinori for Col Solare. Leaving Chateau Ste Michelle in 2005, the inaugural 2004 vintage release of Bunnell Family Cellars was quick to earn accolades in the Washington wine industry. Apart from Bunnell’s great wines, every Washington wine insider knows that if you are in wine county in Eastern Washington, one absolute must-stop is always Susan Bunnell’s Wine O’Clock Wine Bar and Bistro in Prosser. Fabulous food, wine and ambiance that I would put against any bistro in Seattle, Walla Walla or the Bay Area. Truly a gem. In addition to their Bunnell Family Cellars (BFC) line, the Bunnells also produce a dedicated label for their Wine O’Clock bistro and a RiverAerie line named after their homestead overlooking the Yakima River. With Steve Newhouse, owner of Upland Vineyard on Snipes Mountain, the Bunnels make Newhouse Family Vineyards. The Saddle Mountains of the Wahluke Slope. 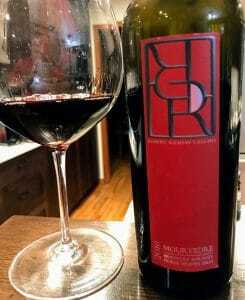 This 2009 Northridge Malbec is from the Bunnell’s Vins de l’endroit series or “wines of a place” aiming to highlight some of the unique terroirs of Washington–in this case the Northridge Vineyard owned by the Milbrandt family. On the western edge of the Saddle Mountains in the hot Wahluke Slope AVA, the vineyard was first planted by Butch and Jerry Milbrandt in 2003. Situated above the flood plain, the shallow soils of Northridge are an ancient mix of sedimentary caliche and basalt. The high elevation promotes a wide diurnal temperature variation of 40-50 degrees from daytime highs in the summer to nighttime lows. This allows the grapes to maintain acidity and freshness as they develop ripe tannins and dark fruit flavors. Below is a very cool video (3:16) from the Milbrandt’s YouTube channel that features a tour of the Northridge Vineyard with their viticulturist Lacey Lybeck and Milbrandt’s winemaker Josh Maloney. Medium-plus intensity nose with a mix of black fruits–blackberries and black cherries–with red fruits like pomegranate. Surrounding the fruit is savory black pepper spice and bacon fat that gets your mouth watering before you even take a sip. Underneath some tertiary tobacco spice notes are wanting to peak out but, overall, this is still a primary fruit driven bouquet for an 8+-year-old wine. 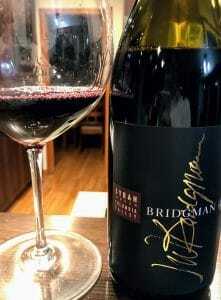 On the palate, the rich darker fruits carry through but still taste quite fresh with the medium-plus acidity. The black cherries, in particular, have that ripe, plucked-off-the-bush juiciness to them. Again, surprisingly young tasting for a Washington Malbec. Usually, I find these wines starting to taste faded after 6-7 years. The maturity of the wine reveals itself with medium tannins that are very velvety and quite hedonistic. Once you get past the textural hedonism, the intellectual hedonism kicks in on the long finish that carries the savory bacon note with just a tinge of smoke. 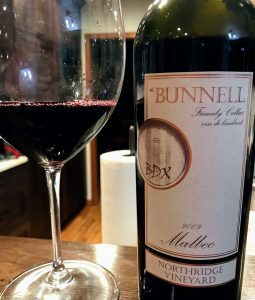 Around 166 cases of the 2009 Bunnell Northridge Malbec were made. The savory bacon notes coupled with the lush dark fruit in this Bunnell Malbec make this wine a real treat to enjoy! This 2009 Bunnell Northridge Malbec tastes like a Washington Bordeaux blend had a baby with Rhone Syrah from Côte-Rôtie. A very delicious combination of rich fruit, mouthwatering structure and savory complexity. I usually feel that wine drinkers pay a premium for Washington Malbec. Often this is because of their novelty and limited acreage. Rarely do they seem to match the value you get from Argentina. That is definitely not the case with this 2009 Bunnell Malbec. At around $35-40, it is worth every penny and well worth the hunt to find. Tagged Antinori, Argentine wine, Beringer, Bordeaux blend, Bunnell Family Cellars, Ch. Latour, Charles Krug, Charlie Hoppes, Chateau Ste. Michelle, Col Solare, Côte-Rôtie, Ed Sbragia, Jean-Louis Mandrau, Josh Maloney, Kendall Jackson, Lacey Lybeck, Malbec, Mike Januik, Milbrandt family, Mouton-Rothschild, Newhouse Family Vineyards, Northridge, Opus One, Patrick Leon, Randy Ullom, Renzo Cotarella, RiverAerie, Ron Bunnell, Snipes Mountain, Steve Newhouse, Susan Bunnell, Syrah, UC-Davis, Upland Vineyard, Wahluke Slope, Wine O'Clock. Washington State is ridiculously spoiled with talented winemakers. Chris Peterson of Avennia/Passing Time, etc. And that is only a small sliver of the immense talent in this state. 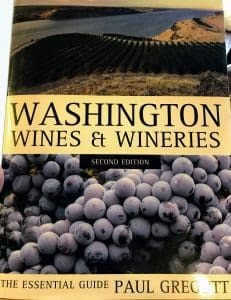 But if you asked me to give you just one expression of winemaking talent that exhibits the best of Washington, I would answer without any hesitation that it is Bob Betz. A Chicago native, Bob Betz moved to the Pacific Northwest in 1954. He attended the University of Washington with the goal of entering med school but, when those plans didn’t work out, he spent a year in Europe with his wife, Cathy, where he discovered a passion for wine. After working at a wine shop for a year, he was hired by Charles Finkel (now of Pike Brewing Company) to work at Chateau Ste. Michelle back when the Washington powerhouse was a small winery operating on East Marginal Way in Seattle. There he was mentored by the famed consultant André Tchelistcheff of Beaulieu Vineyard fame. He started in communications with the estate. As Chateau Ste. Michelle moved to Woodinville and grew into Washington’s largest winery, Betz worked his way up to Vice President of Winemaking Research. Here worked closely with an All-Star roster of winemaking talent such Mike Januik (Novelty Hill/Januik Winery), Cheryl Barber-Jones (Sozo Friends), Kay Simon (Chinook Wines), Joy Anderson (Snoqualmie Vineyards), Erik Olsen (Clos du Bois/Constellation Brands) and Charlie Hoppes (Fidelitas). During this time, his passion for winemaking and starting his own label developed. In the mid-1990s, he embarked on completing the Wine & Spirit Education Trust (WSET) program, earning his Master of Wine (MW) in 1998. To this day, he is one of the few MWs who are practicing winemakers (Billo Naravane at Rasa/Sinclair Estate is another). The vast majority of individuals who hold that title are often writers, educators, wholesalers and retailers. In earning his MW, Betz won the Villa Maria Award for the highest scores on the viticultural exam as well as the Robert Mondavi Award for the highest overall scores in all theory exams. 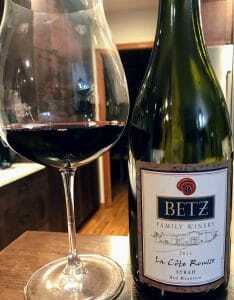 In 1997, Greg Lill of DeLille Cellars offered space in his winery for Betz to make six barrels of his first vintage. Sourcing fruit from Klipsun vineyard on Red Mountain, Harrison Hill on Snipes Mountain and Portteus vineyard in the Rattlesnake Hills AVA, it wasn’t long before the accolades came in with Betz having numerous wines featured on Best of Washington lists by the Seattle Times and Seattle Met as well as earning Winemaker of the Year from Sunset Magazine in 2007. Moving from DeLille, he was one of the first wineries in the now-famous “Warehouse District” of Woodinville before building his own winery. Just as he was mentored by Tchelistcheff and others, Betz has mentored other budding talents such as Kathryn House (House of Wine), Tyson Schiffner (brewmaster at Sumerian Brewing), Ross Mickel (Ross Andrews), Chris Dickson (Twill Cellars), Casey Cobble (Robert Ramsay) and his eventual successor as head winemaker at Betz, Louis Skinner. In 2011, with Bob & Cathy Betz’s daughters expressing no interest in taking over the winery, Betz worked out an agreement to sell the winery to South African entrepreneurs Steve and Bridgit Griessel. Following the sale, Betz agreed to stay on with the winery for five more years. A succession plan was worked out with Louis Skinner, a South Seattle Northwest Wine Academy alum and former assistant at DeLille Cellars, taking over the winemaking duties at Betz Family Winery in 2016. Even after the transition, Betz still is involved as a consultant. In 2017, Bob Betz returned to Chateau Ste. Michelle as a consultant for Col Solare, a joint project with the Antinori family located on Red Mountain. Here Betz will be working with Darel Allwine and Antinori’s head enologist Renzo Cotarella. 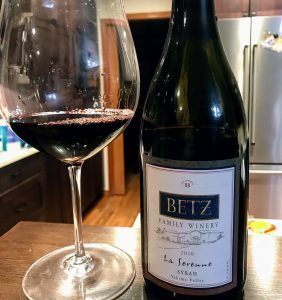 While the future of Betz Family Winery looks strong with the Griessels and Louis Skinner, there is something magical about “Bob’s vintages” of Betz that are worth savoring. Paul Gregutt, in Washington Wines, describes Betz Family Winery as one of the “Five Star Wineries” in Washington and ascribes their success to Betz’s “painstaking planning and attention to detail”, noting that if even a single barrel of wine didn’t meet his standards then it would be sold off rather than used in the wines. 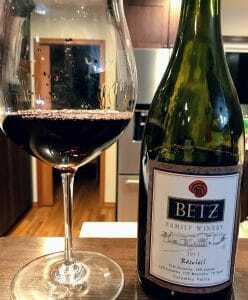 The list of vineyards that Bob Betz has worked with includes some of the “Grand Crus” of Washington like Boushey Vineyard and Red Willow in Yakima; Ciel du Cheval, Kiona and Klipsun on Red Mountain; Harrison Hill and Upland Vineyard on Snipes Mountain. La Serenne, a “Northern Rhone-style” Syrah from Boushey Vineyard. 100% Syrah sourced from Boushey Vineyard. This cool-climate site north of Grandview, Washington is often harvested more than a month after the Syrahs that go into La Côte Rousse from Red Mountain are picked. Around 535 cases were made. High-intensity nose with a mixture of dark fruit–black plums and blackberries–smoke and spice. On the palate, those dark fruits come through. But it is the savory, smokey, meatiness that is the star of the show. Medium-plus acidity keeps it fresh and juicy while the medium-plus tannins have a velvety feel at this point. The long savory finish on this wine would make any Côte-Rôtie lover weak in the knees. Stunningly beautiful and well worth the $70-75. 100% Syrah sourced from Ciel du Cheval and The Ranch At The End of The Road Vineyard in Red Mountain. The parcels from Ciel du Cheval include some of the oldest plantings of Syrah on Red Mountain. The wine was aged in 45% new oak barrels. Around 559 cases were made. Medium-intensity nose. A bit more oak driven with the baking spice. 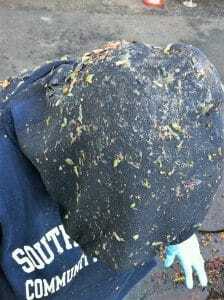 Underneath there is a core of dark fruit, but it is not as defined. On the palate, the fruit is still struggling to be defined. It seems to be a mix of black cherries with a little red pomegranate. Medium acidity and soft medium tannins add lushness to the mouthfeel. The oak is still reasonably noticeable with a sweet vanilla edge and creamy dark chocolate note that lingers through to the moderate finish. A more “New World” style that reminds me of a less sweet Mollydooker. Not my style but at $70-75, it is well in line with Mollydooker’s Carnival of Love and Enchanted Path for those who enjoy those bold, lush wines. 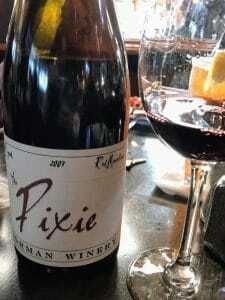 A blend of 54% Grenache, 15% Cinsault, 12% Counoise, 12% Mourvedre and 7% Syrah. Sourced from vineyards in Yakima, Red Mountain and Snipes Mountains, this was the first vintage to include Counoise. Around 662 cases were made. Medium-plus intensity nose. A very evocative mix of blue flowers–violets and irises–with spicy black pepper, anise and Asian spices. This wine smells like you walked into a fantastic Indian restaurant. On the palate, a mix of dark and red fruits come out. But the spices get even more mouthwatering with the medium-plus acidity. The medium tannins are very silky at this point, helping the fruit to wrap around your tongue and linger for a long finish. Still fairly New World in style but at $50-55, this is distinctively charming and complex enough to entice a Châteauneuf-du-Pape fan. A blend of 67% Merlot, 28% Cabernet Sauvignon and 5% Petit Verdot. Often features fruit from Ciel du Cheval and Kiona on Red Mountain, Red Willow and Dubrul in the Yakima Valley and Alder Ridge in the Horse Heaven Hills. The wine was aged in 45% new oak. Around 1186 cases were made. 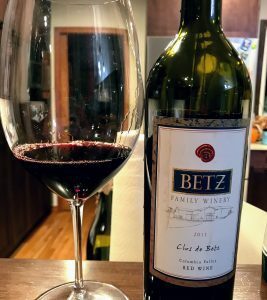 Clos de Betz, a Right Bank Bordeaux style blend. Medium intensity nose–a mix of red and black currants with a floral element that is not very defined. With some air, tertiary notes of tobacco spice emerge as well as an intriguing graphite pencil lead that would have me thinking Cabernet Franc is in this blend even though it’s not. On the palate, the tide tilts more towards the red fruits dominating with the medium-plus acidity adding a sense of freshness to the wine. The graphite pencil notes disappear, being replaced with an espresso chocolately note that plays off the tobacco spice that carried through. Medium tannins are well integrated and velvet–showing that this wine is probably at its peak drinking window now. Moderate length finish brings back the floral notes though I still can’t quite pinpoint them. At $65-70, you won’t confuse this for a St. Emilion or Pomerol. But this wine amply demonstrates how wonderful Bordeaux varieties–particularly Merlot–do in Washington State. Tagged Alder Ridge Vineyard, Alex Golitzin, àMaurice, André Tchelistcheff, Andrew Will, Anna Shafer, Antinori, Avennia, Beaulieu Vineyards (BV), Ben Smith, Betz Family Winery, Billo Naravane, Bob Betz, Bordeaux, Boudreaux, Boushey Vineyard, Cabernet Franc, Cabernet Sauvignon, Cadence, Casey Cobble, Cayuse, Charles Finkel, Charlie Hoppes, Chateau Ste. Michelle, Châteauneuf-du-Pape, Cheryl Barber-Jones, Chinook Wines, Chris Camarda, Chris Dickson, Chris Figgins, Chris Peterson, Chris Upchurch, Christophe Baron, Ciel du Cheval, Cinsault, Clos du Bois, Col Solare, Constellation Brands, Côte Bonneville, Côte-Rôtie, Counoise, Darel Allwine, DeLille, Dubrul Vineyard, Erik Olsen, Fidelitas, Gramercy Cellars, Greg Harrington, Greg Lill, Grenache, Harrison Hill, Horse Heaven Hills, House of Wine, Januik Winery, Joy Anderson, Kathryn House, Kay Simon, Kerry Shiels, Kiona Vineyard, Klipsun Vineyard, Leonetti, Louis Skinner, Master of Wine, Merlot, Mike Januik, Mollydooker, Mourvèdre, Northwest Wine Academy, Novelty Hill, Passing Time, Paul Gregutt, Petit Verdot, Pike Brewing, Pomerol, Portteus vineyard, Quilceda Creek, Rasa Vineyards, Rattlesnake Hills AVA, Red Mountain, Red Willow Vineyard, Renzo Cotarella, Rhone, Rick Small, Rob Newsom, Robert Ramsay, Ross Andrews, Ross Mickel, Scott Greer, Seattle Met, Sheridan Vineyards, Sinclair Estate, Snipes Mountain, Snoqualmie, Sozo Friends, St. Emilion, Steve Griessel, Sumerian Brewing, Sunset Magazine, Syrah, The Ranch At The End of The Road Vineyard, The Seattle Times, Twill Cellars, Tyson Schiffner, Upchurch Vineyards, Upland Vineyard, Washington Wines and Wineries, Wine & Spirit Education Trust, Woodinville, Woodward Canyon, Yakima Valley.